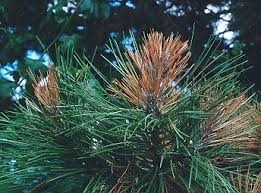 Do you know what causes these brown needles on your pine tree? Is it diplodia blight, pine engraver beetles or just seasonal leaf drop? Come to the Shasta Master Gardener meeting on Thursday, Jan 8th (6:30 pm, Shasta College Downtown Campus, Room 8220) and listen to Don Owens, CalFire entomologist, answer this question. Don will speak on common forest pests, including mistletoe, bark beetles, Armillaria root fungus (which can affect both your conifers and vineyard) and more. You'll learn how best to deal with forest pests (when and how to remove dying trees to prevent the spread of disease) and what you can do during drought to help your landscape trees.